Empire and Ecology within the Bengal Delta broadcasts a shift in gears inside the bourgeoning and bustling discipline of the environmental histories of South Asia. 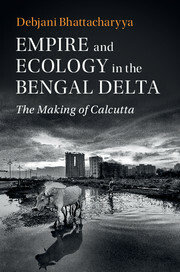 As a substitute of taking the acquainted route that revisits themes within the present canon—forests, irrigation, and carnivore management—Debjani Bhattacharyya cuts an altogether recent path by exploring how radical ecological change was important to the making of city colonial Calcutta (right this moment’s Kolkata). The core claims within the e-book pivot on the various arduous British efforts from the late eighteenth century onward to remodel Calcutta’s soggy marshy origins into landed concrete areas—the firmed-up surfaces upon which have been constructed residential, industrial, and industrial infrastructure and the premise for widespread monetary hypothesis in actual property. What lastly emerged from the protracted confrontations over land shortage, we’re advised, was a much less marketed, if not totally unspoken, consensus among the many varied contending city pursuits: that the outlying marshes and untidy swamps have been “lands-in-waiting” reasonably than distinct hydrological phenomena (p. 172). This unanimous and decided name for slicing off town from its “watery hinterlands,” in Bhattacharyya’s estimate, truly sought to masks a radical ecological rupture by which land and water have been meant to be break up into distinct and separable entities, as a substitute of being acknowledged as ecologically entwined domains and integral to Bengal’s deltaic environments.